A story of love, murder, and madness aboard an enormous spaceship bound for the future. Amy desperately wants to trust Elder. But can she? All she knows is that she must race to unlock Godspeed's hidden secrets before whoever woke her tries to kill again. Across the Universe opens with the line, "Daddy said, "Let Mom go first."" After watching her mother be cryogenically frozen for the flight through space, Amy's father gives her a choice: she can also be frozen, or she can stay on Earth with her aunt and uncle, continuing her life as she knows it. It's not a choice for her, though. As much as she loves her life, her friends, and her extended family, Amy could never choose that over her parents. So she too is frozen, and she dreams, endlessly, until one day she wakes up... fifty years ahead of schedule, and with no way to return her to her frozen state. Elder, the boy destined to become the ship's captain, and his friend, Harley, take Amy under their wing as they investigate why her cryo-chamber was unplugged, all the while attempting to keep the rest of the cryo-chamber's occupants safe. With twists and turns dogging their every step, Amy and Elder's only choice is to try to discover the ship's secrets before whoever is attacking the cryo-chamber can come after them. But uncovering those secrets may be even more dangerous . 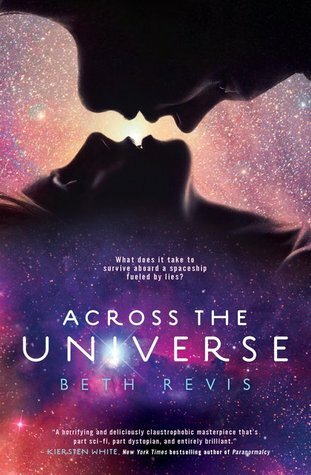 . .
Across the Universe was one of my most highly-anticipated 2011 debuts, and Revis does not disappoint with this space-based dystopian thriller. This is thankfully the first in a planned trilogy, so we will definitely be getting more of Amy and Elder's story. Revis deftly weaves intrigue and murder into a Brave New World-esque landscape set in space, but without making the atmosphere so science fiction-y that it would turn off those who aren't fans of science fiction. Across the Universe will blow you away. I also have to add that the day after finishing this novel, this article popped up on my Yahoo home page about one-way trips colonization to Mars. It really makes you wonder just how far away this science is!